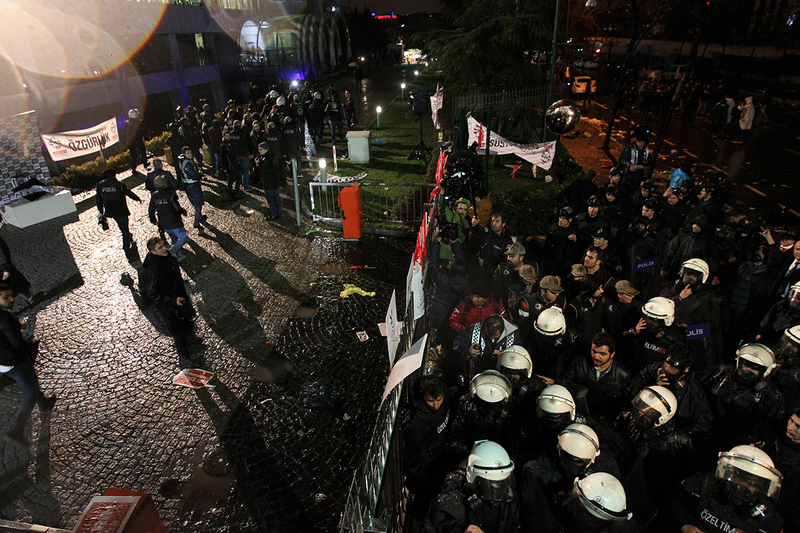 On March 4, 2016, exactly one year ago today , hundreds of riot police officers fired rubber bullets and gassed loyal readers of Turkey’s best-selling daily when they stood vigil on the sidewalk across the newspaper’s offices to peacefully protest the news of impending the unlawful takeover of Zaman newspaper. Without even bothering to warn the protesters, police rushed to embark on a violent action against so many including women and children who have broken no laws. 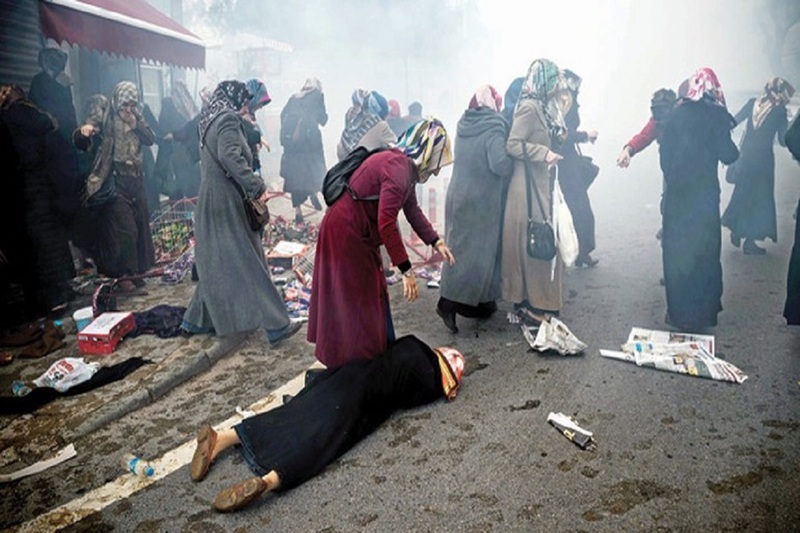 A horrible picture of woman, dragged on the ground with a blood all over her faces, permanently coined in the bitter memories of many who painstakingly watched the terrible saga as it was unfolding live on TV. 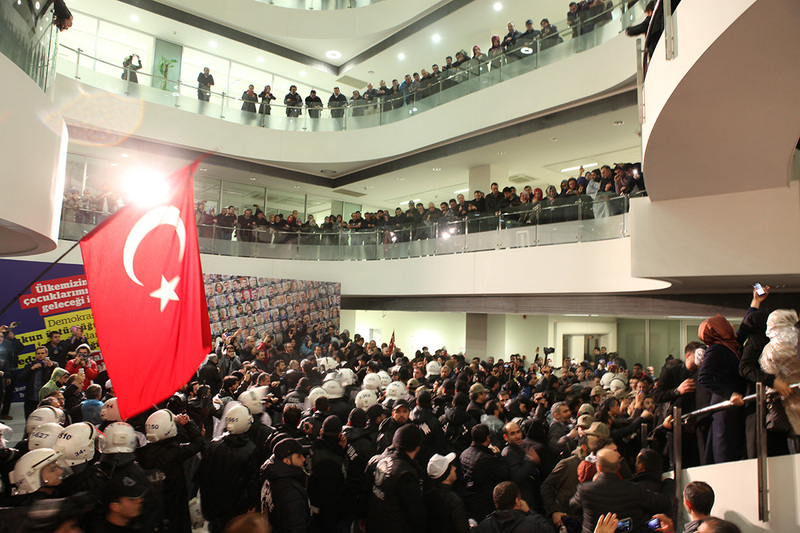 Shortly afterwards, some 400 riot and anti-terror police stormed the offices of Zaman, ransacking the place, going through editorial rooms, and kicking out the reporters and editors from the building although there was no such warrant authorizing the police to take such action. 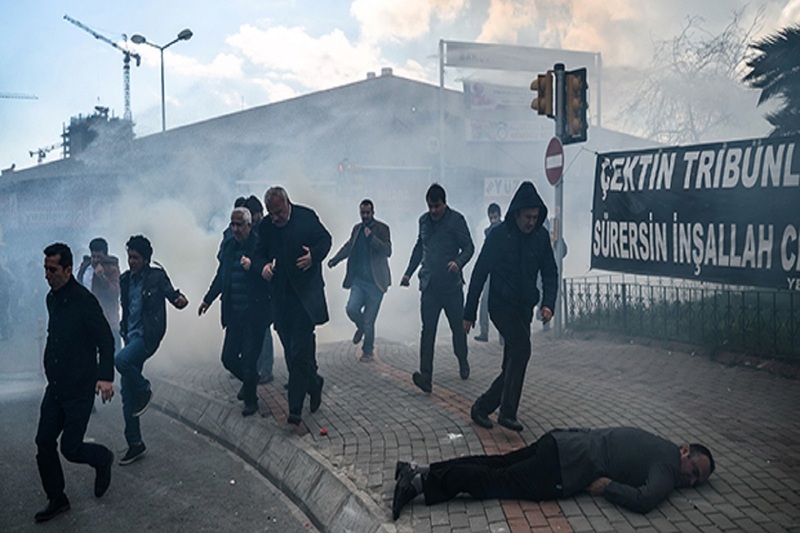 The excessive teargas even filled the inside of the newspaper building, making it very difficult to breathe for many journalists as masked police officers were running wild inside. Zaman, the largest daily that enjoyed some 1.2 million copies sold on a daily basis, had been targeted systematically by Turkish government and viciously attacked by then-Prime Minister and now autocratic President Recep Tayyip Erdoğan in the aftermath of twin corruption investigations of Dec. 2013 that exposed mass corruption scandal, incrimination family members and inner circle of Erdoğan. Zaman daily was one of the few media outlets courageous enough to publish damning details from investigation file that forced four minister to resign. The investigation revealed how billions of dollars were funneled by an Iranian sanction-buster and gold trader Reza Zarrab through Turkey to circumvent sanctions on Iranian regime in exchange for millions of dollars in bribes. The probe also uncovered how Erdoğan secretly meeting with alleged al-Qaeda financier Saudi national Yasin al-Qadi who was on UN and US sanctions lists at the time. He was paraded into the country by the protective detail of Erdoğan despite the travel ban and was enjoying an access to the highest echelon of Turkish government. Erdoğan rushed to hush-up investigations by dismissing all members of the security forces and judiciary who took part in the graft probes and jailing them afterwards on trumped up charges. In the meantime, he also started targeting Zaman for covering serious allegations made in the investigation files. He labeled the investigation as a “coup” against his government and scapegoated his troubles to the Gülen movement, a civic group that was inspired by US-based Muslim intellectual Fethullah Gülen. Zaman, seen as affiliated with Gülen, was the prime target. Erdoğan started exerting pressure on Zaman with a hope that the paper would change its editorial stand on corruption, stop publishing articles that reveal kickbacks in the government and halt investigative reporting that exposed Erdoğan government links to armed radical groups in Syria. 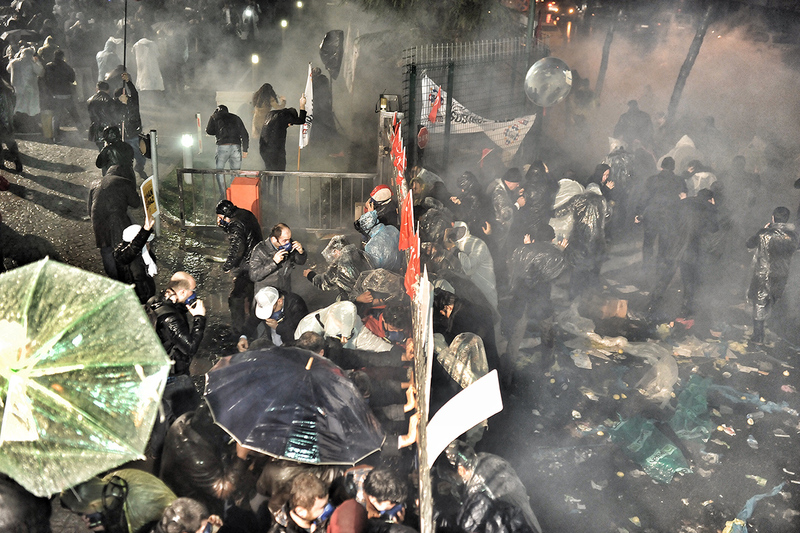 At a political rally on March 22, 2014, in Ankara, Erdoğan called on to the public to stop buying Zaman newspaper. 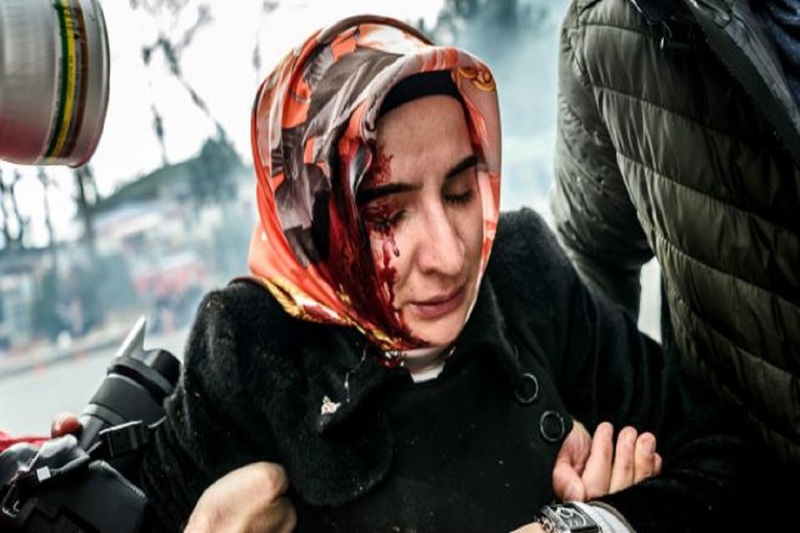 Zaman reporters were denied access to press briefings, faced accreditation restrictions for even international events that are being hosted by Turkey. Erdoğan even personally harassed and attacked Zaman reporters in few press briefings that Zaman journalists were allowed in. Coupled with that, the government put a pressure on advertisers, threatening them with auditing and financial penalties if they keep placing ads in the nation’s largest daily. All advertisement given to the paper was effectively blocked, both from the state and private sector. 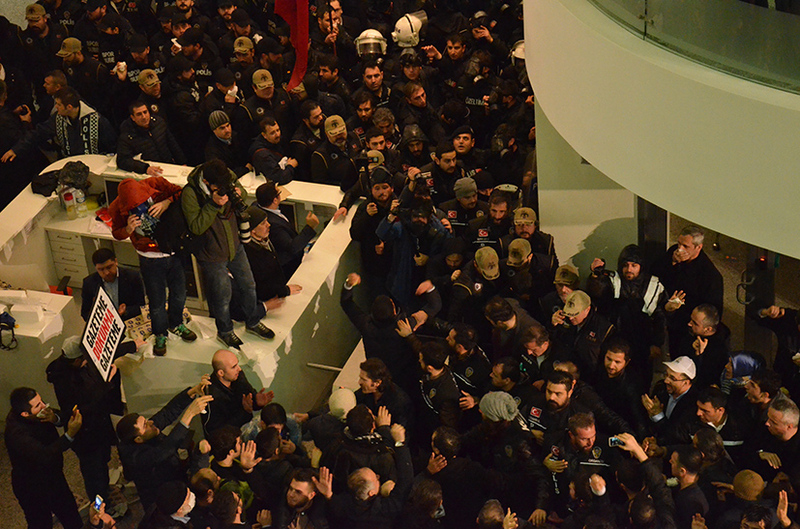 Zaman employees and reporters were systematically being mobbed by hundreds of court cases being brought against them. 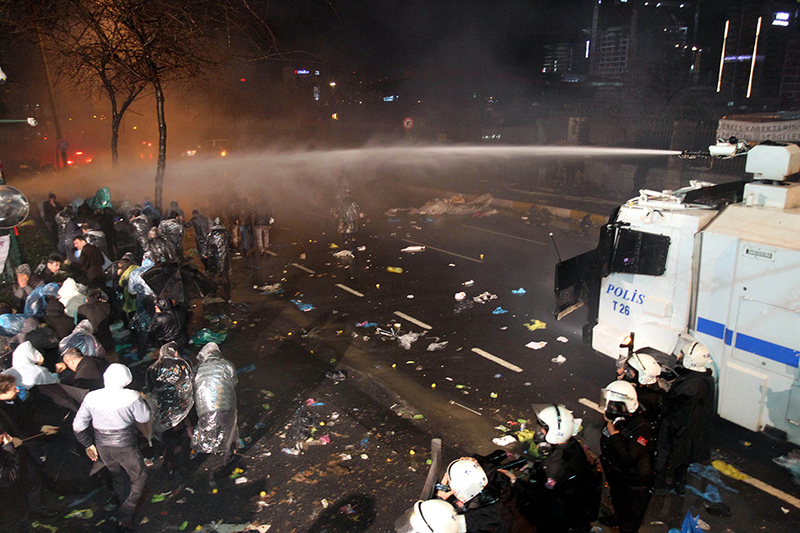 At the time of the takeover by the riot police, there were 323 court cases against the paper alone. Of those, 53 were cases personally launched by Erdoğan. There were over 500 court orders to forcefully cease publication of some news stories and refute. The government also kicked off an extensive tax audit for the newspaper. Just to send a chilling message of fear to media outlets in Turkey, Erdoğan orchestrated the arrest of Zaman editor-in-chief Ekrem Dumanlı around the time of the first anniversary of the corruption investigations. 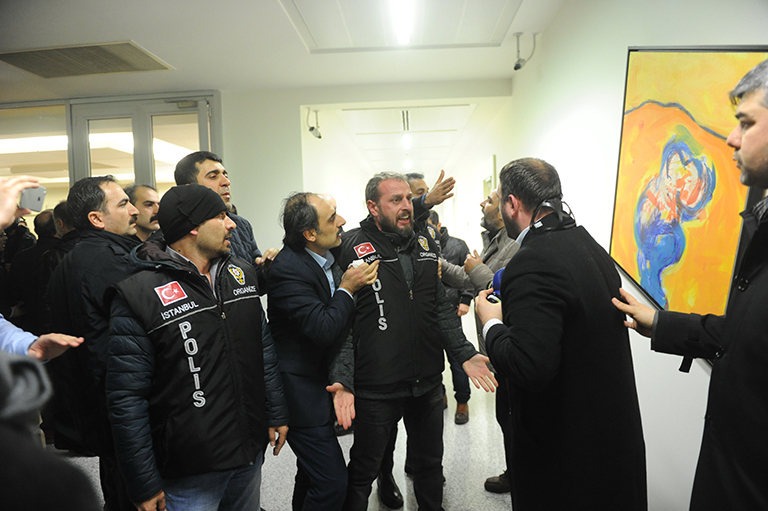 The police came in and detained Dumanlı in his editorial office on charges of smearing an al-Qaeda-affiliated group called Tahşiyeciler via two op-ed pieces written by contributors to Zaman and one news story that were published in the newspaper. Dumanlı remained in detention for four days before his release pending a trial. In a bizarre twist, Dumanlı was accused of supporting the investigation into an al-Qaeda offshoot through publishing critical articles in Zaman. Frivolous lawsuits and financial pressure by the government did not work out the way Erdoğan planned in changing the critical editorial stand of Zaman but had taken a toll on not only advertisers but also on subscribers. 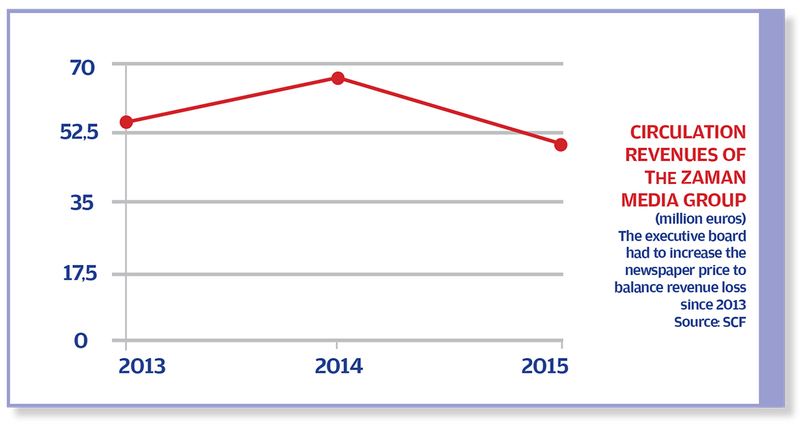 The circulation of the paper fell from 1,219,354 in December 2013 to 954,335 in December 2014. It further dropped to 693,695 in December 2015, but remain as the lead national newspaper with quite a margin to second largest mainstream daily Hürriyet. By then, the government realized intimidation tactics would not work and decided to take over the company altogether on false charges on March 4, 2016. The government secured the order of corporate takeover from a special judgeship that was created by Erdoğan government as a special project court to crack down on critics in 2014. The order did not cover any interference into editorial side as it was temporary change of the corporate board of directors until the trial gets finalized. Yet the government care-takers immediately dismissed senior editors including chief editor Abdülhamit Bilici who replaced Dumanlı only few months ago. The paper’s editorial stand was changed 180 degree overnight, by turning it yet another mouthpiece and propaganda media outlet for the government. Government-appointed trustees were carefully selected among those who were henchmen of the AKP government. Metin İlhan was the Secretary General of UETD, an AKP-backed NGO operating in Europe. Tahsin Kaplan, a lawyer who was known for his sympathetic views to the Iranian revolution and Sezai Şengönül, an unknown poet. None of them had any experience in running a large media company like Zaman. One of the first steps taken by the government appointed trustees was to erase the entire news archive of the paper, taking down the website and removing all the published articles that goes back to some 30 years. The news that were deemed critical of the government were not accessible anymore. The caretakers also fired over 200 journalists without any severance payments and compensation. 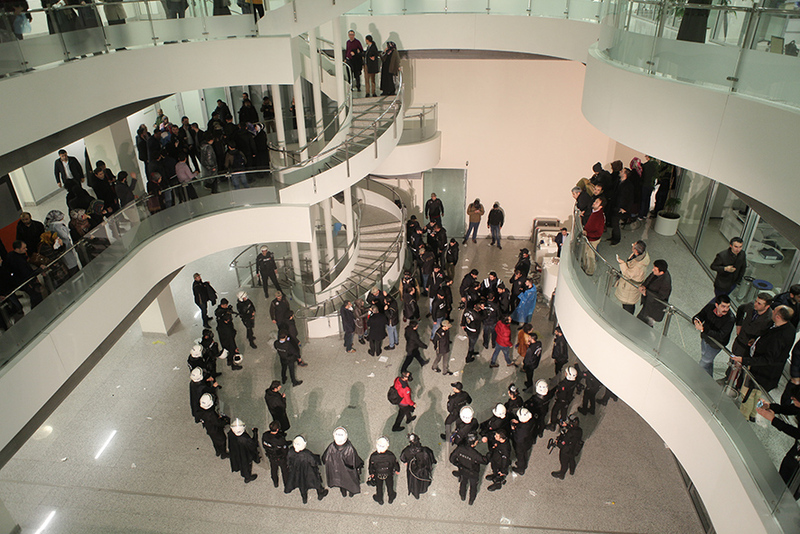 The remaining skeleton crew were systematically mobbed and harassed by the security forces who had been present in the building all the time. Alongside Zaman, Today’s Zaman, the English-language daily; Aksiyon, the weekly news magazine; Cihan, the nation’s largest private news agency; Turkish Review, bimonthly English journal on politics and foreign policy; Irmak TV, a TV channel broadcasting cultural content; Zaman Kurdish and Zaman Arabic, web portals publishing news in Kurdish and Arabic were also taken over by the government. A distribution and delivery company, namely Cihan Medya Dağıtım was also confiscated and over 1200 people were immediately fired from their jobs. With all of his columnists dismissed and editorial independence gone, the sales of the paper hit the rock bottom by falling to 5,275 at the end of March. 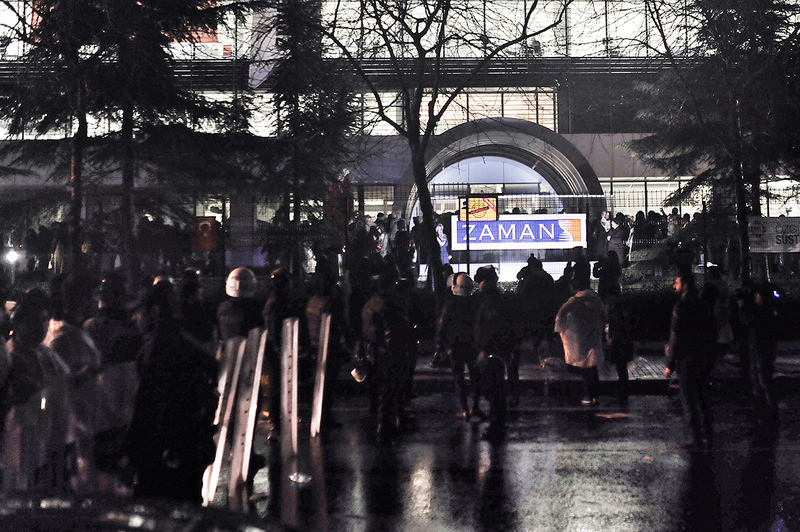 Zaman was the second media outlet that was taken over by the government. Erdoğan also orchestrated the seizure of third largest media conglomerate, İpek Media Group, on Sept.1, 2015 by taking over two dailies, two national TV networks and one radio. After the failed coup attempt on July 15, 2016 with government decrees, 183 media outlets were closed down. Zaman was only one of them. The newspapers Yarına Bakış, Yeni Hayat and a news agency Muhabir Ajans established by journalists who were illegally fired by the government-appointed trustees were also shut down in the aftermath of failed coup. Currently 60 employees of Zaman newspaper are now behind the bars in Turkey and tens of them are in exile or remain at large in order to escape the relentless persecution the government has been pursuing against journalists. Shareholders’ attempt to take the case to the Constitutional Court has failed as well. At present, the work is underway to bring this case to the European Court of Human Rights. Stockholm Center for Freedom, an advocacy group that monitors rights violations in Turkey, issued a report on March 1, 2017, saying that the number of jailed journalist has reached to a new record of 200 with Germany’s Die Welt, Deniz Yücel being among new arrestees. Of these journalists, 179 are arrested pending trial and without a conviction. Most of the journalists do not even know what the charges are or what evidence, if any, the government has because the indictments were not filed yet. 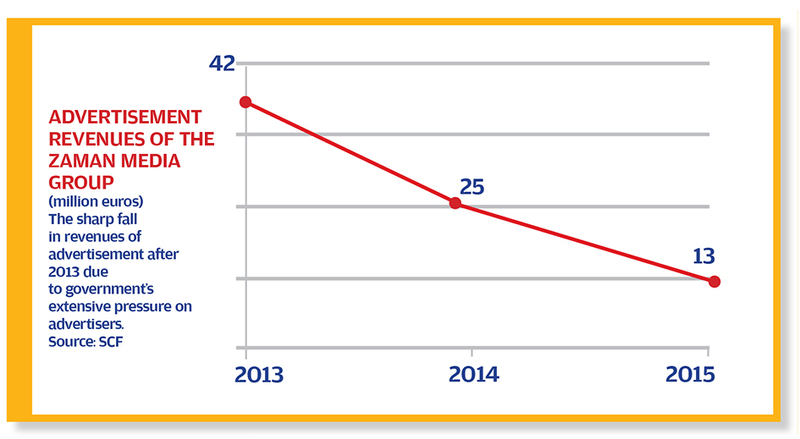 Also, over 180 media outlets have been closed by AKP government last year. 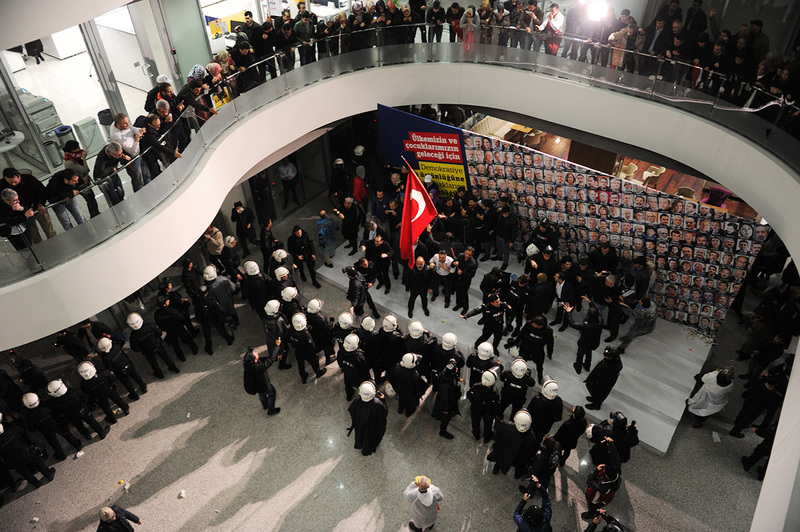 After a court appointed a trustee to the Zaman media group on March 2016, police attacked protesters who show solidarity with the paper’s staff.